I took this picture at Emdoneni Lodge, near Hluhluwe-Umfolozi Game Reserve, in South Africa. Emdoneni has a cat rehabilitation centre and this caracal had been with humans since he was a kitten. I went in the enclosure and put the camera as low as possible with the 18mm lens. 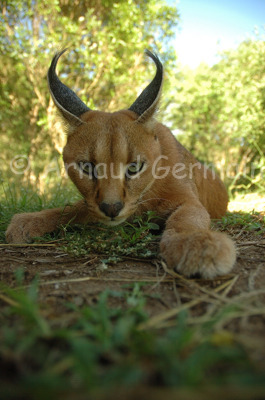 The caracal was playful, trying to paw the camera. I made the most of a quiet moment to take this shot.